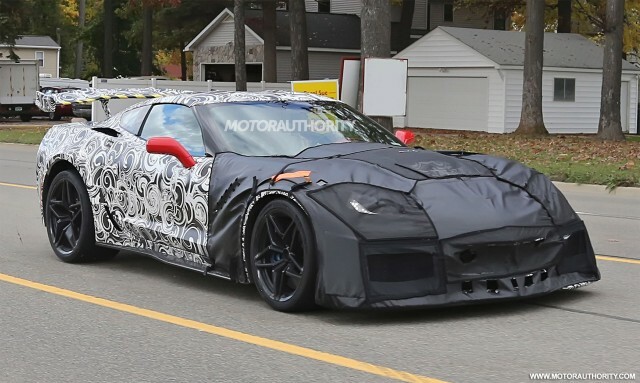 Behold our latest spy shots and video of what’s likely to be a new generation of the Chevrolet Corvette ZR1 supercar. Corvette talk of late has centered on a new mid-engine platform but that’s not expected to be introduced until the arrival of the next-generation Corvette (C8), tipped to be debuting at the 2018 Detroit auto show. Before that Chevy will send out the current Corvette (C7) with something special, and a safe bet would be on a ZR1 model making a return. Featured here is what we believe to be a C7 Corvette ZR1. The photos above show a prototype for the coupe while the video below, from Indian Autos Blog, shows both coupe and convertible testers. General Motors Company [NYSE:GM] on May 16 trademarked the ZR1 name with the United States Patent and Trademark Office. Admittedly trademark filings are often made to simply protect a storied name, but these prototypes suggest otherwise. The prototypes resemble an ordinary C7 Gran Sport or Z06 but there’s no missing the huge rear wing (slightly smaller wing used on convertible). We can also see some massive rubber wrapped around new Ferrari [NYSE:RACE] style pentagram wheels. Some of shots show the front of the car and reveal a honeycomb-like mesh similar to what we see on the Camaro ZL1. GM applies the ZR1 name to its most extreme Corvettes (ZR-1 for earlier generations) and so far has used it on the C3, C4 and C6 generations. The last ZR1 was launched for the 2009 model year and was powered by a supercharged 6.2-liter V-8 delivering 638 horsepower and 604 pound-feet of torque. This output is already exceeded by the C7 Z06, which has 650 hp, so expect even more oomph for the C7 ZR1. GM is known to be working on a new LT5 V-8, though this is expected to be reserved for the C8. Instead, look for an uprated version of the C7 Z06’s LT4. Don’t be surprised if the supercharged 6.2-liter V-8 ends up delivering more than 700 hp for the C7 ZR1. GM is expected to have the overheating issues with the engine solved by then. Look for a debut of the C7 ZR1 at next January’s 2017 Detroit auto show. It may well be the last front-engined Corvette to ever be launched and is sure to end up a collector’s item. Look for a price tag exceeding $100k.